Pier 39 is one of San Francisco's best tourist attractions. Pier 39 itself has great views of the Bay, restaurants, and attractions for children. On good days, you can see seal families resting under the sun. Other tourist attractions surround Pier 39. Ferries to other parts of the bay depart from Pier 41. Fisherman's Wharf is about a 10 minute walk away. Ghirardelli Square is 15 minutes away. For 2 hours of garage parking starting 12 noon on Saturday, the cheapest is $18, the average is $25, and the most expensive $40 in a .25 mile area. 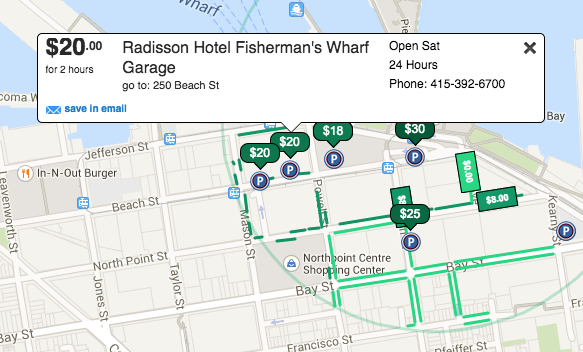 If you plan on eating at Pier 39 for 1-2 hours and leaving immediately, then you can get the cheapest parking by using the "Validated Parking" policy for the Pier 39 Garage located at 172 Beach St. 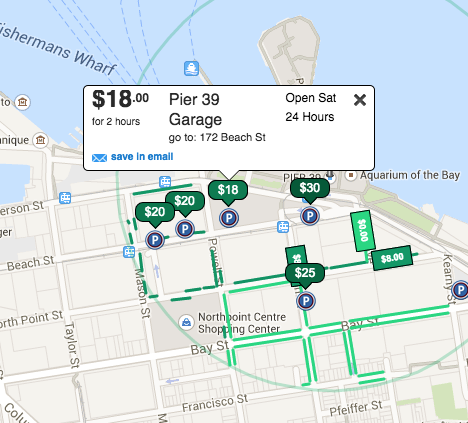 If you dine at any of the "full service" restaurants in Pier 39 and spend the required amount, then you can receive a discount on your parking bill at the Pier 39 Garage. A full service restaurant is a place where you can sit and a waiter serves you. A pretzel stand is NOT a full service restaurant. 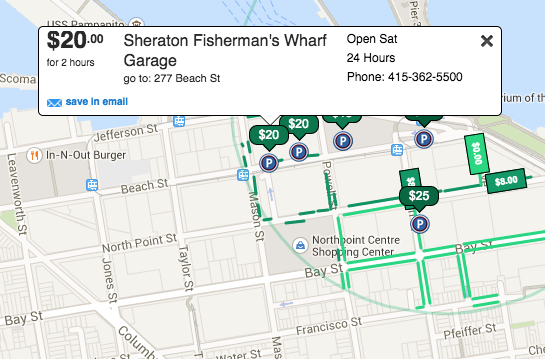 The validated parking at Pier 39 Garage is only a good deal if you plan on eating there and leaving immediately. 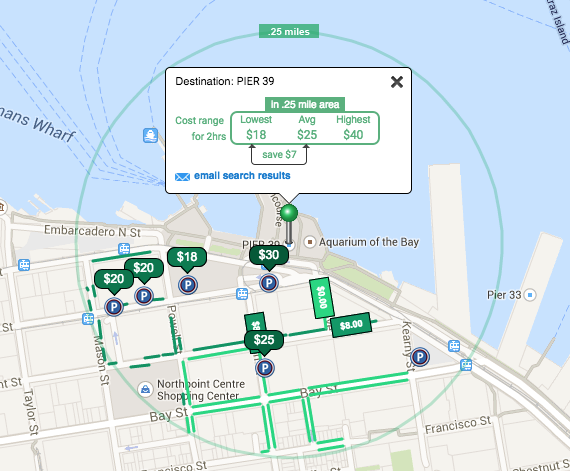 You should look for other parking options if you want to wander around the Pier 39, Fisherman's Wharf and Ghirardelli Square areas because parking without validation is $9.00 / hour. Spending 5 hours wandering through the area without validation can cost you $45.00. The garage at 2210 Stockton St may be the best deal for stays 3 hour or longer because you pay a fixed price of $25.00 on a weekend day. It is even cheaper on a weekday: flat price of $18.00. Most other garages continue charging you each hour. This garage charges a set flat fee. Parking meters near Pier 39 fortunately have 4 hour maximum limits instead of the typical 2 hour limit. 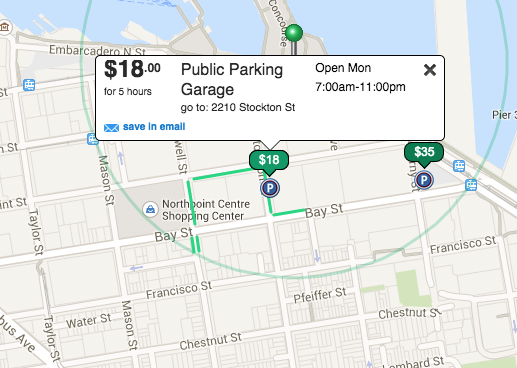 Metered parking spots are in high demand because they are the least expensive option in the Pier 39 area. Prices for 2 hours range from $3.50 to $8.00 for 2 hours.